The all new BMW X4 is a sporting model that exudes dynamic motoring and powerful agility. Its unique casualness is modern and extravagant and ensures a self-confident appearance for all occasions. THE NEW BMW X4 IN MORE DETAIL. With the release of the all-new BMW X4, we introduce the new M Sport X model. Pulling from extreme sport inspiration, the M Sport X seamlessly blends the dynamic design of M Sport cars with the recognisable off-road character of a BMW X model. Frozen Grey accents highlight the exterior design on the front faces of the BMW Kidney Grilles, side skirt and wheel arches, emphasising the BMW M4's distinctive off-road presence. Standard specification includes a Panoramic sunroof and BMW LED icon Adaptive Headlights with optional, unique M Sport X 20" alloy wheels, making the all-new BMW X4 M Sport X a welcomed addition to the BMW X Range. The striking sculpted exterior design provides a stronger Coupé silhouette which is easily recognisable as the BMW X4. 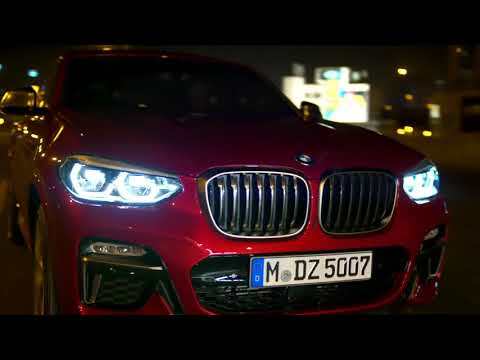 With adaptive LED Headlights and LED rear lights as standard, paired with the newly designed larger kidney grilles, the all new BMW X4 is a fresh unmistakable face in a highly competitive market. A sleek, refined interior compliments the eye-catching, sporting exterior. The use of contrast stitching with a wide selection of Vernasca Leather upholsteries continues the standout attitude the BMW X4 has to offer. Fuel economy figures for the BMW X Series range: Extra Urban 29.4 - 68.9 mpg Urban 16.1 - 54.3 mpg Combined 22.6 - 62.8 mpg CO2 emissions 292- 119g/km. Figures may vary depending on driving style and conditions.Test drive subject to applicant status and availability.